London based Jazz Promoter & broadcaster Anthony L Steinberg has been a well known character across the UK's Capital City (& beyond!) Jazz Scene for well over 15 years. Here exclusively for Jazz Views, Anthony reports on various jazz gigs he attends across his home town of London. Anthony will also be bringing the latest events, happening's, gossip & general going's on in the world of jazz, from London & beyond!. one long set the multi award winning Singer/Pianist had stormed her way through an emotional set list leaving everyone wanting more!!. In fact I took along a very lovely Singer/Songwriter to see LIANE & until I told her about my 'JAZZ GODDESS' had not even heard of her! !, by the second number this 'POP/FOLK' artist was crying & at the end told me she was just simply blown away by CARROLLs all round stage craft!!. Having seen CARROLL countless times over the years I'm always curious to see how she ups the anti at the following gig, well tonight she left THE JAZZ CRIER once again utterly gobsmacked with a STUNNING version of the old "MORECAMBE & WISE" BBC TV series theme tune 'BRING ME SUNSHINE' which she turned on its head & made totally her own!!. THE JAZZ CRIER cannot wait to get a copy of the latest CARROLL offering "SEASIDE" & if tonight's gig is anything to go by I'm sure will add to her awards cabinet!!. THE JAZZ CRIER insists that every person who reads this review, who LOVES good music should have 'SEASIDE' in their collection!!. I make no apologies in saying CARROLL is probably one of EUROPE'S finest music talents performing in our continent today & I know that the POP/FOLK Singer I took to see her now absolutely adores her as well!!. AN EVENING WITH EARL OKIN606 CLUB, CHELSEA,SW10 0QD. I first encountered "THE EARL OF OKIN" way back in the early 80s, while in the studio audience of a recording of the old BBC TV MICHAEL PARKINSON chat show!. Even back then EARL OKIN struck a cord with me, & over the years since I have seen EARL many times & even interviewed him on a show I did for SOHO RADIO, "WHAT IS JAZZ? ", (EARL was one of the best guests I had on!). Tonight's gig showcased what EARL OKIN is all about & making him 'look good' were BASSIST SIMON WOOLF & DRUMMER MICHELE DREES. As DREES herself quite rightly said 'EARL OKIN is a national treasure', & duly presented two fine sets in a less is more manor, no histrionics just delivering the songs in a natural way weather serious ones, comedy ones, STANDARDS, LATIN or ORIGINALS!. One thing I have not mentioned about OKIN, as well as being a fine MUSICIAN is also a top line professional COMIEDIAN, (you can take the man out of comedy but not the comedy out of the man!! ), as it prooved with OKIN at ease with the audience, recounting various stories including what a horrible day he had even getting a flat tyre!!. THE JAZZ CRIER unfortunately could not stay right to the bitter end, but what i did get to see certainly warrents a 5***** RATING. This gig was something a little different as it was a celebration of Head Of Jazz at Royal Academy Of Music Nick Smart reaching his milestone of the big 40! !.Legendary Brit Saxophonist Stan Sultzman organized the event to honour nice guy Nick, by presenting some of the biggest names in British Jazz.The gig was run slightly differently from normal, first up starting earlier than usual at 20:15 & rather than one band headlining we had in fact 4 doing a mini set each.The birthday party got under way with a specially convined band for the night who came up with highly original name of MARK LOCKHART/CHRIS MONTAGUE BIRTHDAY BAND 5TET, featuring MATT ROBINSON on PIANO (a former student of SMART), TIM GILES on DRUMS & MISHA MULLOV ABBADO on BASS & of course the two main names as well.After a short break CHRISTINE TOBIN & LIAM NOBLE took over for a few numbers, then from the previous PARLIAMENTARY JAZZ AWARD WINNER OF VOCALIST OF THE YEAR to the current holder NORMA WINSTONE led band with NIKI ISLES on PIANO, STEVE WATTS on BASS & HENRY LOWTHER on THE TRUMPET. Before the next band went on NICK was presented with a BIRTHDAY CAKE from the 6, & the evening was rounded of by a set from PICKFORD (the only band of the night with a proper name). A good crowd turned up to support NICK which was particularly welcome as all ticket proceeds went to THE GREAT ORMOND STREET HOSPITAL.All musicians performed for FREE!.Happy birthday NICK from THE JAZZ CRIER & all at JAZZ VIEWS. THE JAZZ CRIER was supposed to have reviewed the first night of MARTIN's PIZZA EXPRESS residency, but when I got to the Dean Street club it was completely SOLD OUT not a seat to be had so I could not review the gig until tonight, the last night of this AWARD WINNING BBC RADIO 3 "JAZZ LINE UP" Presenter's residency. The show was a selection of CLAIRE MARTINS favourite BILLIE HOLIDAY songs which was dedicated to the iconic Singer 100th year since her birth!. MARTINS choice of rhythm section was stunning GARETH WILLIAMS on PIANO & VOCAL, ARNIE SOMOGYI on DOUBLE BASS& on DRUMS the one & only MATT SKELTERN as MARTIN called them "THE THINKING WOMAN'S CHIPPENDALES!!. Joining MARTIN for the two sets was special guest for the night SAXOPHONIST JULIAN NICHOLAS, who I must honest I had not come across before, but was a real discovery!!. Normally I like to highlight one or two numbers from each set, but that would be really unfair as MARTINS performance gave each song it's own personality & to choose one or two over others would not be right!. It is easier just to list all the songs performed which I'll do at the end. CLAIRE also brought her years of Presenting BBC RADIO 3 "JAZZ LINE UP" to the fore with a natural ability to communicate with her audience which was once again a packed house at the PIZZA EXPRESS. Photo is of CLAIRE MARTIN M.B.E with her RHYTHM SECTION of MATT SKELTERN GARETH WILLIAMS & ARNIE SOMOGYI.The JAZZ CRIER was pleased to have finally made it in to see this TRUE JAZZ ARTIST & if you can only get to see one BILLIE HOLIDAY show this year, make sure it's this one!! 'I LOVE YOU PORGY', 'LOVE COME BACK TO ME', 'IN MY SOLITUDE', 'LET'S DO IT', 'I'LL BE SEEING YOU', 'I'VE GOT MY LOVE TO KEEP ME WARM', 'CRY & MELLOW', 'CHEEK TO CHEEK', ENCORE - 'ALL OF ME'What a set list!, how can I choose from that lot?? ?.P.S- MATT SKELTERN will be back at THE PIZZA EXPRESS Tuesday 26th/Wednesday 27th with his own show "THE BIG SCREEN TRIO", please get along to Dean Street if you can. London based JAZZ Composer & Booker PETER MATTHEWS is one of those best kept secrets whose work in my humble opinion is up there with the likes of PORTER/BERLIN/GERSHWIN etc, but because PETER is composing today when JAZZ is a 'niche' art forms rather than the popular music of it's day as it was way back when, PETER works do not get the same level of attention. Tonight's gig celebrated THE MATHEW SONGBOOK catalogue old & new to its pure magic & diversity it deserved. BASS was ANDY HAMIL & ROD YOUNGS was on the DRUMS. They were also joined by 1Up's DAVE LEWIS on SAX & the sublime playing of VIOLINIST CHINARA SHARSHANOVA. The PIZZA EXPRESS audience certainly got there money's worth on the Singers front too!, headed BY LONDON BASED amazing CANADIAN SINGER MICHAEL De MARCO & ASHLEY JOY. They were joined too by MARIA DAVIES/ MICHAEL COLLINS/ SUE JARVIS/ ROMY SUMMERS/CLARE JORDAN. They all performed PETER songs beautifully during the one 'long' set. Taking a short turn at the PIANO in the interval was direct from an appearance on BBC LONDON GUNTER KURMAYR PIANIST with RAY GREAT. The night got going with a super & very appropriate song of PETER, SOHO as of course that's where we were in Dean St!. A couple of the highlights, MIKE COLLINS on ARROGANTLY ELEGANT, SUE JARVIS with BOSS PAULO De MARCO version of SUNDAY & JOY with LOVE AFFAIR & WHEN I HOLD YOU.One of my all time MATTHEWS favourites is a stunning ballad called NEXT TIME, which was performed in a new setting for my ears as a duo with JOY & De MARCO combing wonderfully!. The evening concluded with PETER HIMSELF leading on HOT SOUP SIDE SALAD & RAVIOLI. Tonight's review was originally meant to be from another gig, but once I realised that these two master's of reeds were on I had to change the review & headed to The Pizza Express JAZZ CLUB on Dean Street for the final gig of the band's current tour. Set two 6 numbers were in similar vain to the first, both boys on STROLLIN', & JULIAN's highlight was PEQUERNITA (a NEIL ANGILLEY Latin original), or as it was suggested it should be on a visit to South London PECKHAM RITA!!. I also thought MILVERTON's own CAROL SONG was beautifully performed as well. Any of you who have become regular readers of this column may have noticed that all of my gig reviews so far have coincidently all been 5***** ratings, so from now on only 5* gigs will make it onto this page. Tonight's performance from Producer RICHARD PITE, is in fact my first 5*+ review as the double header programme PITE presented as a continuing series of specials at this spectacular venue, CADOGAN HALL just off Sloane Square. The shows in the past have concentrated on the 20s/30s/40s music era, but tonight's offering was a bit more modern showcasing the Magic of NINA SIMONE & RAY CHARLES. Taking to the stage for the first half of the evening was wonderful Singer LIZ FLETCHER, presenting SIMONE ' S music as interpreted by rather than inpersonating the star!, which meant FLETCHER was free to be her sparkling self, delivering a line up of CLASSICS that included, IT'S A NEW DAY, WILD IN THE WIND & my own to personal favourites from the first half MY BABY JUST CARES FOR ME & the climax of the set was I WISH I KNEW HOW IT WAS LIKE TO BE FREE. I have known FLETCHER for many years first coming across this fine Singer at a afternoon session back in the day in SOHO at CAFE BOHIEM, I have then seen her over years at BOISDALE OF BELGRAVIA, it was great to see LIZ at a venue that her talents really deserve a 900 capacity hall which was almost at capacity! !, (not an easy task to deliver these days). Supporting FLETCHER was PITE himself on DRUMS, NIGEL PRICE on GUITAR JULIE WALKINGTON on BASS & the MUSICIAL DIRECTOR CHRISTIAN VAUGHAN on PIANO. The second half was taken over by the RAY CHARLES PROJECT led from the PIANO by SINGER/PIANIST JEREMY SASSOON. Jeremy hails from MANCHESTER, & is a UNITED fan & commented it was difficult for him to be at a venue so near to CHELSEA FOOTBALL CLUB just a week after they won the PRIEMER LEAGUE, but none the less led his 17 piece BIG BAND to a rousing set that included HALLELUA I LOVE HER SO/ GEORGIA ON MY MIND & IN THE HEAT OF THE NIGHT all RAY CHARLES hits, along with a new number to me that CHARLES recorded during his barron years THE JEALOUS KIND. The band was also joined by three WONDERFUL SINGERS ANNABEL WILLIAMS, CHARLENE HECTOR & STRICKLY COMES DANCING own HAYLEY SANDERSON who were JEREMY answer to CHARLES backing Singers the RAYLET'S, Tonight we had the JAYLET'S!!. Also amongst the band was IAN DIXON & GUITAR LEGEND JOHN PARRACHELLI, THE JAZZ CRIER was chatting to IAN SHAW/GEORGIA MANCIO & JAZZ Promoter/Manager FRAN HARDCASTĹE. THE JAZZ CRIER will be at future JAZZ REPERTORY COMPANY, events & knows of two further concerts later this year, both again at CADOGAN HALL. Saturday September 19th at 19.30, will be JAZZ in NEW YORK The 19 50 's while Sunday November 22nd at both 15.00 & 19.00 as part of THE 2015 LONDON JAZZ FESTIVAL RICHARD PITE Presents PAUL WHITEMAN: THE KING OF JAZZ. THE JAZZ CRIER highly recommends both these offerings from the excellent & hard working JAZZ REPERTORY COMPANY. Back in THE LONDON EYE (06a), I reviewed The THUMP FESTIVAL & said my top band was THE M.T.B QUARTET. Tonight's gig was equally as good as the THUMP gig & I will come to them in a minute. First up though on the stage at this very welcoming Camden venue was one of my favourite recent discovery's, Singer/Songwriter & Pianist BERENICE SCOTT. SCOTT performed a solo KEYBOARD set covering a mix of Covers, originals & songs from her second album POLARITY which portraide her vocal ability to a treat, SCOTT has been called a British DIANA KRALL, & has that accessible crossover vibe, which audiences really seem to latch onto!. At a recent gig, she had fans turn up from as far afield as Germany, France & even America. Moving onto the main act of the night M.T.B QUARTET gave a full FORGE house a preview of their soon to be recorded album. The boys being led from the DRUM KIT by LONDON'S own HUNGARIAN BENCE BOLYGO struck a cool groove, & reminded me why I had made them the number 1 band in the THUMP FESTIVAL. BOLYGO'S solo in the encore 'FOOT PRINTS' was the real standout highlight of the whole night, & was getting cheers from the crowd!, talking of which, T L.E Spotted SINGER & TV PRESENTER KATIE NEIMAN in the audience. The LONDON EYE suggests you should definitely keep taps on both BERENICE SCOTT & M.T.B QUARTET as they are definitely going places. MITCH DALTON is one of those go to musicians who has worked in the industry for many many years. Dalton a top Guitarist, a few years back created this band containing some of the studio session world's finest, hence the name, but being able to present & play the music DALTON himself loves rather than what others want him to play. This first night of a two night residency featured some of MITCH pals & indeed a new name to me,who stepped into the DRUM seat at very short notice was BRETT MORGAN, while on BASS GUITAR was STEVE PEARCE & taking the PIZZA STEINWAY was non other than "STRICTLY COME DANCING" own MUSICIAL DIRECTOR, DAVE ARCH. It was a great evening of Standards, DALTON'S own compositions, & covers. It was like the American West Coast had transferred to Dean St!!. A couple of highlights were in the first set 'As Times Goes By' given a DALTON treatment & 'On Green Dolphin Street' which the mistro renamed for the night 'ON GREEN DOLPHIN DEAN STREET'. Second set highlight for me was 'WES WES WES'. This is a super band, that you should try & catch whenever you possibly can. You could say "it's Jazz Jim but not as we know it!. The Pizza crowd really enjoyed the night, & the band even got do an encore!. To finish this review, all I will just say 'they were GREAT'. 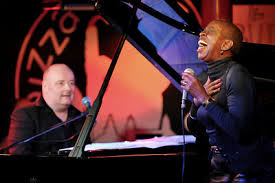 This was going to be a report on another gig, but after The London Eye popped into The Pizza Express Jazz Club on Wednesday night to catch the last set of a two night residency by Ian Shaw & Madeline Bell, was forced to choose this gig as The Gig Of The Week. Even though the T.L.E only caught the second set, (as was at another gig earlier in the evening at Crazy Coqs), I saw enough pure class from these two fine experts in their chosen art. Shaw sublime as always on not only Vocals but also Piano, & Bell showcasing her beautiful vocal range to the limit, even inviting a question & answer session from a full Pizza Express house & reminiscing with Shaw on how they both met way back when!!. Another sign of class from Bell was when she appologised over the microphone over a incident between herself & the staff, not many would take the trouble do that!!. The set I witnessed was some classic Jazz Standards, & as a duo they were made in heaven. Even Pizza management was going on about how great they were. Sometimes less is more & this is a perfect example of that!. More power to there elbow.RATING *****Next The London Eye will be again from the Pizza Express featuring Mitch Dalton & The Studio Kings. This gig is a ongoing series in which JOHN "MR SHOWBIZ" ALTMAN invites various friends to join him for a night of 'Mayhem', in the past we've had MONTY NORMAN, & even JOHN ALTMAN the actor - best known as 'Nasty' Nick Cotton of Eastenders fame, & the former England Cricketer Marc Butcher. Tonight was a terrific show masterminded by the EMMY & B.A.F.T.A award winner Saxophonist JOHN ALTMAN (not the actor! ).The band was made up of ANDY CLYDENDERT on BASS, PETE CATER on DRUMS, MITCH DALTON on GUITAR, on Piano was the Incredible rising talent JACOB COLLIER & special guest who came all the way from L.A for this gig Violinist NORA GERMAIN, who earlier in the evening was in demand as was interviewed on & did a short performance for Arise News international tv channel.The band was also joined for a few numbers in the second set by the LEGEND that is EARL OKIN.Highlight for me though was when the 'Young Lions' as ALTMAN called them, COLLIER & GERMAIN had the stage to themselves & did a couple of FANTASTIC duets, as JOHN said, "Jazz is in safe hands with these two!. The programme delightfully showed off all the performers on stage to there max, & with the calibre of CLYNDERT/CATER & DALTON on hand to guide the two 'young lions', there was never any dout that the packed PIZZA EXPRESS audience had nothing but a memorable time. The London Eye spotted Sebastian Scotney from London Jazz News in the audience, who seemed to be well enjoying the show & for those of you of a certain vintage, may remember listening to Capital Radio back in the day, & it's 'Flying Eye' traffic reporter Russ Kane was also in. The night flew by, it was a memorable one that will live in the memory until the next instalment.NORA GERMAIN will be hosting her own night at the PIZZA EXPRESS June 28th, 'THE LONDON EYE' will be there covering the gig, & highly reccomeds that you should be to. There may well also be something coming up soon for JACOB COLLIER at The PIZZA, watch this space for details. EDITION RECORDS chairman MARTIN HUMMEL was launching this C.D. on his new 'incubator' label UBUNTU MUSIC. The artist chosen for its first release was Singer NOEMI NUTI and her album 'NICE TO MEET YOU', got the label off to fine start. NUTI, is a well liked artist, & the proof was in the pudding as the PIZZA EXPRESS were turning people away!!. The LONDON EYE, noticed Deputy JAZZWISE editor MIKE FLYNN and JAZZ FM's CHRIS PHILIPS in the house & the T.L.E was even chatting to BBC ARTS EDITOR WILL GOMPERTZ. Upstairs there were a few RADIO 2 peeps in who could not get into the Club, the T.L.E was very fortunate indeed to get a stall at the bar!. HUMMEL himself got proceedings under way at 20.30, the first set absolutely flew by! The band was made up of an international line up of Stella musicians. Rhythm section was CHRIS ELDRED on PIANO, TIM THORNTON on BASS ERNESTO SIMPSON on DRUMS. FILIPE MONTEIRO was on GUITAR while UBUNTU MUSIC's own QUENTIN COLLINS was on the TRUMPET.The second set saw NUTI with co-writer & PIANIST ANDREW McCORMACK guest on a few numbers too. The atmosphere was FANTASTIC and lots of C.D.s were sold. One nice touch by NUTI was in the first set one of her songs CHARADE was dedicated to her MUM. NOEMI NUTI is in fine hands under the wings of manager MARTIN HUMMEL, & in my 'HUMMEL' opinion this is one artist who you will be hearing a lot of in the future, & not just here in THE LONDON EYE. The next The London Eye will be April 1st, Pizza Express, 'JOHN ALTMAN & FRIENDS' with JACOB COLLIER/EARL OKIN & NORA GERMAIN joining in the fun. Following hot on the heels of the recent Steinway Festival at the Soho club, The Pizza Express presented in colaboration with Bolygo music it's second festival in as many weeks. This 5 night extravaganza celeberates & showcase the humble but essential instrument to any good band, the DRUM KIT!!. The Thump Festival is organised by Muruat Diril Cymbals. The first ever Thump Festival gig back in 2013 featured the Talents of Richard Bona, was the late great London Evening Standard & Jazzwise reviewer Jack Massarik gig of the year!. a full planned show much to the apprication of the audience who stuck it out, & got their just reward!. Night 3 MAMMAL HANDS TRIO took over THE THUMP FESTIVAL. The Penultimate night we were treated to not one but TWO bands, THE MTB QUARTET with Bolygomusic own BENCE BOLYGO on Drums & from Bristol The COLEMAN BROTHERS with a couple of guest singers SARAH COLEMAN amongst them. Final night was left to the THE PRB SESSIONS WHICH took on a groove all of its own with a FUNK/SOUL & LATIN feel. The objective of the THE THUMP FESTIVAL was well & truly achieved showcasing the diverse range of the Drum kit, & I'm sure that JACK MASSARIK would have approved of this year's festival too!. Please note that PRB SESSIONS sister band PB UNDERGROUND will be having their album launch April 10th at Chelsea Football Club, UNDER THE BRIDGE Venue, & The London Eye will be there to report on it. RATING *****Next The London Eye (06a), will be from The Thump Festival again at The Pizza Express. This 11th version of the now priemier UK Jazz Awards, is a GREAT advert for the best in not only British Jazz but true cross party devides with some well known big beasts such as Lord John Prescott & Kenneth Clarke former cabinet minister both in attendance. The London Eye was amongst the great & good of Jazz too with what seemed liked the whole of the Jazz world in the Pavilion Terrace. The ceremony got under way shortly after 7.30pm with Radio 2 Presenter Moria Stewart acting as host!, Talking about Radio 2, Jamie Cullum was presenting his live radio show & was interviewing all the winners too, as well as presenting an award. There is always a good community feel to these awards, with everyone cheering on everyone else & always thanking so many others!!. Vocalist Of The Year which was deservedly won by Norma Winston & was presented by Dame Cleo Lane, and the Media award was presented to London Jazz News. while the Venue of the year went to St Ives Jazz Club in Cornwall. Peter Edwards took the Jazz Newcomer Award. It's always interesting to see who are given these awards, & I look forward to next year's event, & not just for the good food & drinks on offer either!!. Next London Eye (06) will be from The Pizza Express Jazz Club, Sunday March 15th with Dave Lewis 1UP band. Before I go into this year's festival in detail, a bit of history on this now established annual event, which has become a highlight of The London Eye Jazz Calender. BBC R3 Jazz Line Up programme!!. This 7th edition certainly lived up to expectations, with an array of talent some familiar, some new. The opening night saw 3 ladies take the first set, with Russian born Pianist, Genia having the honour of opening the festival with a solo spot before inviting MOBO Award Winner Zoe Rahman to join her, Zoe then invited Alcyona Mick to finish the first set, then home grown Liam Noble was joined by Benoit Debecq for the second half. to yet another brilliant show, which was enjoyed by a packed Pizza Express house including actors Tim Woodward & Harry 'The Simpson's' Shearer, as well as Pizza Express senior management were in the audience too!!. The final night brought out 3 A- list UK Pianists Kit Downes, Jason Rebello & Gwyilm Simcock were joined by another new name to me superb finish Pianist Iiro Rantala. The programming of such a festival is a real art form in its own right, Ross Dines has surpassed himself once again, with this latest edition!. I will be interested to know how Dines will be able to make next year's festival even better?. So please can I reserve my ticket now?. This is a extra report as The London Eye was invited by Politician Bob Blizzard to this unique concert for 'Fairness & Diversity', in support of the Labour Party. The event got under way shortly after 7.30pm when a stunning solo vertuoso performance by Sax man Andy Shepherd got things going, Bob Blizzard then took to the stage for a brief welcome message before Juliet Kelly & Kate Williams took over, it was interesting that when Juliet asked the audience how many where here for Jazz or for the Labour party it was roughly half & half!!. Juliet was followed by the likes of current Parliamentary Jazz Instrumentalist Of The Year Arun Gush, Christine Tobin the current Parliamentary Jazz Vocalist Of The Year along with Phil Robson took the ĺimelight, Liane Carroll also made a first set cameo appearance, Soweto Kinch with Jay Phelps took there turn with Soweto doing his improvised routine. The second set got under way with a couple of speaches with one coming from Lord John Prescott (former Debuty Prime Minister), before Darius Brubeck with Dave O'Higgins gave a fine performance then it was over to Alex Webb's Cafe Society Swing featuring the nights biggest band, included amongst the numbers were John Etheridge & Singer Vimala Rowe who I have to say, sang one of Jazz world's hardest songs there is to sing, Billie Holiday's Strange Fruit, & who received a well deserved standing ovation!. Then came Ian Shaw, who was joined first by Claire Martin, M.B.E then aforementioned Liane Carroll who got the audience singing along to You've Got A Friend, the evening finished with a great 'set' from Courtney Pine, that included a different arrangement of Take 5, which I know not only got the approval from the audience but Darius Brubeck as well. It was a memorable night that will live long in the memory, it was John Newey of Jazzwise who came up with idea having been inspired by the Jazz For Obama concert back in the 2012 American Presidential elections.Bob Blizzard kindly invited The London Eye backstage where 'T.L.E' got to hang with the great & the good of Jazz. I have to say that I think, that only the Jazz world could put something like this on, with Jazz I tend to find it's a 'us' mentality, rather 'me', where as in other genre's it tends to be the other way round!. I can only give every person on that Barbican stage tonight 10/10 for effort & comitment.On a final note I hope those who came tonight because they were Labour supporters left the Barbican as firm Jazz fans too, as they were treated to a GREAT example of what the Jazz world is all about. Please note that there are other political party's out there.The Next T.L.E (05) will be from the 2015 (March 4th-9th) Pizza Express Steinway Festival. 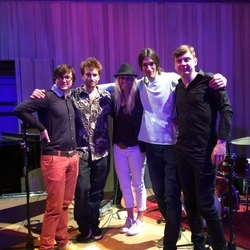 at her London Jazz Festival event. The Pheasantry, At The Pizza Express November 18th. This fast establishing Cornish delight is definitely one to look out for, & is the real deal. There will be an extra 'T.L.E' Report this week (04a) on Friday 27th February from the Jazz For Labour event. Even on Valentine's night the The London Eye is out & about checking out the Capital City Jazz scene, just as well I'm in LOVE with Jazz!!. I want to try from time to time to bring you different act's & this why I've selected this gig as my gig of the week. Proceedings got under way with a mini set from none other than comedian Bobby Davro having never heard him sing before I was a bit apprehensive about his Vocal ability, but I have to say, he is a top class singer, really knowing his stuff, with great control of his voice, & not reading any charts either!. Bobby sang from the Band's Sinatra Songbook, performing such classics as Come Fly With Me/I've Got You Under My Skin/ You Make Me Feel So Young/The Lady Is A Tramp, in between Davro was of course cracking some great jokes, which I think have to stay in the venue!!. By the time he left to go to a comedy gig the audience was well & truly in the spirit of things, & boy what a absolute packed Jazz Cafe Poska it was, I even ended up sitting on the staircase!.Taking the remainder of the first set was another new Singer to me, Peter Savizon, who brought a bit of calmness to the stage & concentrated on the songs, & what songs they where from the Nat King Cole archive, such as On The Street Where You Live/Let There Be Love/When I Fall In Love/Don't Get Around Much Anymore to name a few. Glen Mcnermara was a surprise guest & The London Eye spotted Singer Shireen Francis & Jazz fan Michael Collins in the audience too. The band is led by Musical Director & Guru from the Sax Shop.co.uk The Silver Burch himself Paul Burch. This was a real St Vslentine night treat. Show- The Seven Deadly Sins!. Former Jazz Services Chairman Bob Blizzard gave a rousing introduction to the evening, after which Soweto, ably demonstrated his skill as a award winning musician!. 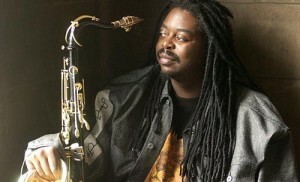 This two times MOBO Award recipient, is a totally unique character crossing many boundaries, not only as a well known Jazz musician, but equally at home in the Rapper & Hipp Hop stages too. This gig was well recived by the Pizza Express audience & amongst those attending was Georgia Mancio who expressed a great view that Soweto clearly demonstrates, his poise, passion & years of learning his craft, (I couldn't put it any better Georgia!). My particular highlight of a Soweto gig is when he gets the audience to suggest words for him to do a Rap about, that always is well received as it was again at the Pizza Express. Nick Jurd (no relation to Laura), & Shane Forbes ably supported Soweto throughout his one long set, there was no question that it was Soweto's gig, Soweto also very cleverly used to his advantage a laptop as part of his band. The Barbican Centre Friday 27th February in aid of Jazz For Labour. 10, Dean Street, Soho, W1D. Gig- Tammy Weis- "Best Of Tammy"
Top class evening of music from Tammy showcasing her life through song. I have known Tammy for well over 10 years now, having first encountered her in the back Bar of the 606 Club. To me Tammy is one of the UK best kept secrets, & every time I see her she never fails to deliver the goods as the Pizza Express gig proved yet again!. Tammy knows how to entertain the audience & they always fall in love her. Am eagerly awaiting Tammy next album which is based on Canadian Songwriters, I am looking forward to seeing Tammy at the 606 Club in Chelsea in April. Very appricative crowd, demanded not one but two encores & Tammy sold quite a few of her latest CD "Where I Need To Be". Evening was a great success for Tammy.